Tomatoes keep straggling into my kitchen from my fall garden, rather scarred, cracked and water-logged. A week of rain and cool temps have left them a little worse for wear, but they gallantly keep right on producing. In my book, the best way to work with these late season tomatoes is to concentrate their flavors by cooking them down into something thick and rich, like Smoky Tomato Jam. 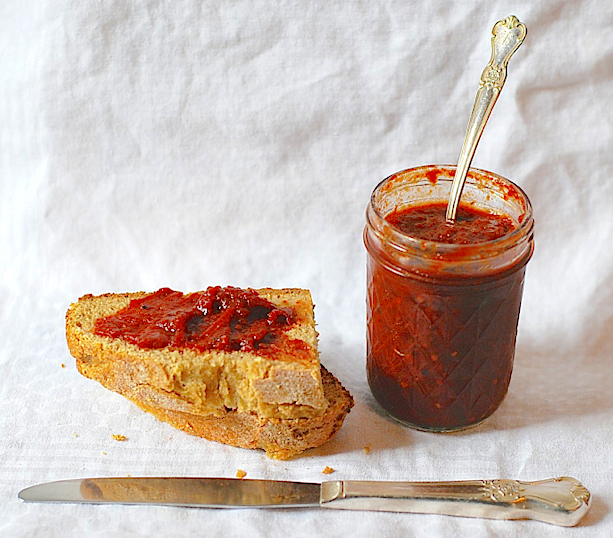 Based on my friend Molly Herrmann’s recipe from Tastebud Catering and Kitchen in the Market, this jam has lots of depth, with the right balance of acidity and sweetness. It’s really more of an all-purpose condiment than just a sweet jam. I think of it alternately as ketchup, bbq sauce and toast spread with a savory kick. The brilliance of Molly’s recipe is smoked paprika, which adds fantastic flavor without heat, making it perfect for kids and adults alike. I’ve bumped up the amount of tomatoes to increase the “tomato-y” flavor, and used my not-so-secret weapon, roasting. 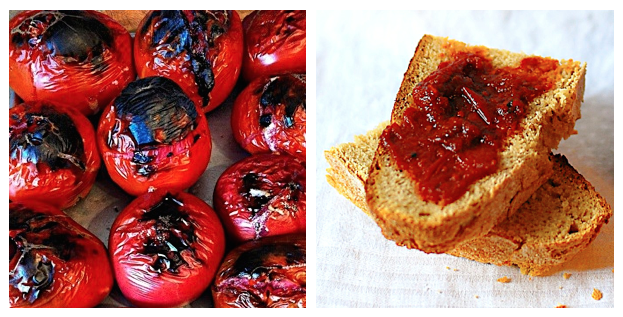 I roasted the heck out of these tomatoes, putting the smokiness over the top. You would not believe how awesome this jam is on a grilled cheese sandwich. And meatloaf is just divine topped with this before baking in the oven. Yesterday I had it with a slice of runny camembert on sourdough toast. OK, I’m hungry now. No one is getting this for Christmas. It’s just to good to leave the house. Prepare 12-14 half pint jars and lids in a hot water bath. Lay all your tomatoes on a baking sheet and roast them under the broiler until their skin is charred. Blend them in a food processor until chunky. Add the tomatoes and all remaining ingredients to a pan. Bring to a boil then simmer on low until the mixture becomes a jam-like consistency. It takes about an hour. Stir occasionally, especially as it begins to thicken to prevent scorching on the bottom of the pot. You don’t want it THAT smoky! Ladle hot jam into clean, hot half pint jars, leaving 1/2” headspace. Wipe the rims and add the lids. Process in a boiling water bath for 15 minutes at a full rolling boil. Yields 12-14 half pints.